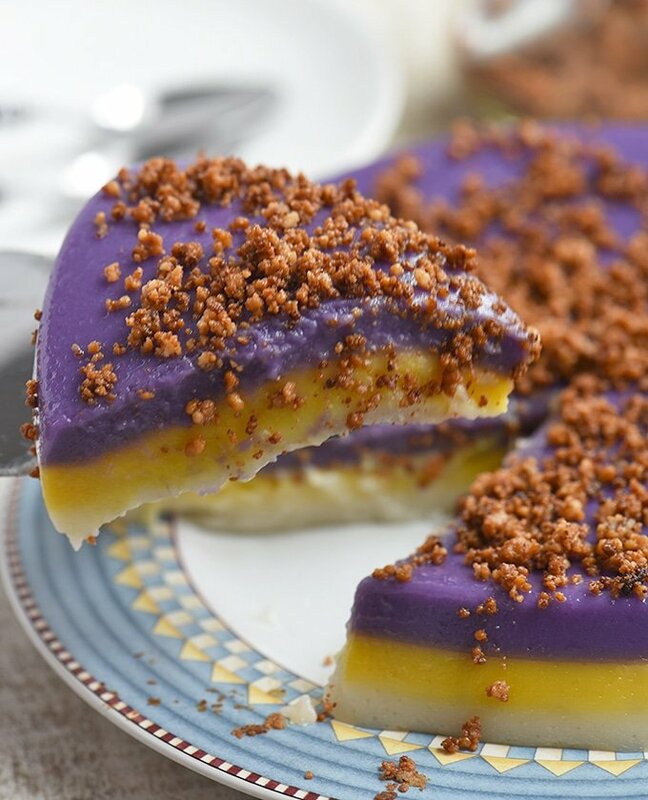 Sapin-Sapin is as tasty as it is pretty! Soft, chewy, and topped with golden latik, this Filipino steamed glutinous rice cake is a delicious midday snack or after-dinner dessert. 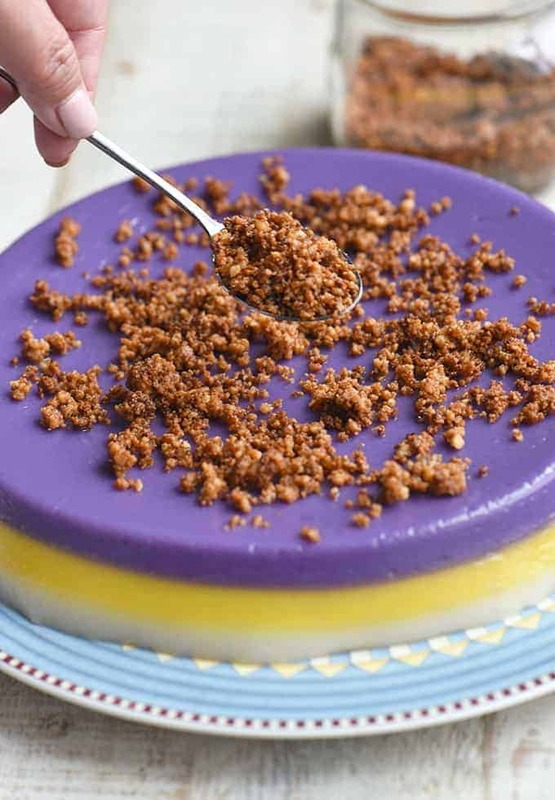 I’ve wanted to make sapin-sapin for the longest, but I was intimidated by what I thought to be a very complicated process. So when I went home to the Philippines a few years ago, I asked our suking magkakanin to teach me, along with other kalamay recipes. As it turned out, I didn’t need a 7,185-mile trip to learn how to make this Filipino steamed cake. The whole process is easy; it’s almost child’s play! 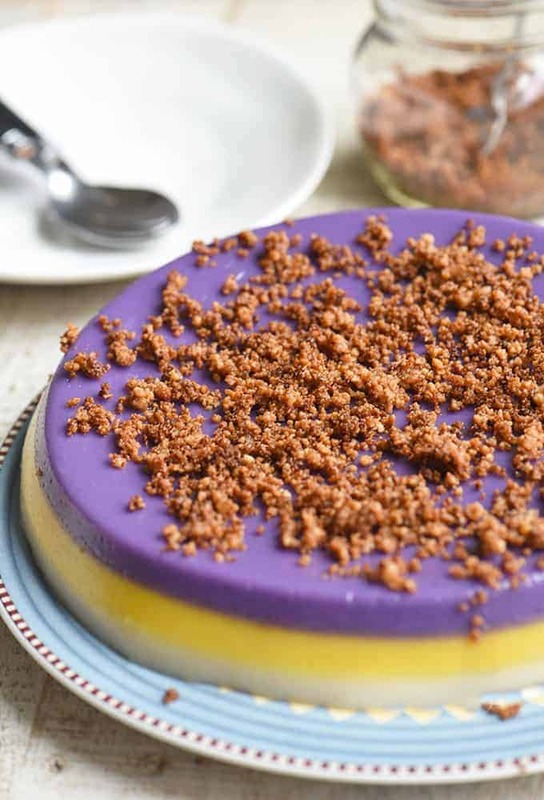 Sapin-sapin, which means layers, is one of the easiest Filipino desserts you can make. All it takes is mixing glutinous rice flour, coconut milk, condensed milk, and sugar into a smooth batter which you then divide into three portions, color, and steam one on the top of the other. I had so much fun making it again this afternoon; adding in the extracts and watching everything come together into one colorful sweet treat! Half of the work in the recipe is making the latik. Although you can skip this step and use toasted coconut shreds instead, I urge you to take the extra effort. These golden curds taste so much better than dried coconut, and their rendered oil can be brushed on the sapin-sapin to add aroma and flavor. To speed up the process, use coconut cream or kakang gata (first extraction) as it’s more concentrated and will reduce quicker. The rice batter is about 6 cups which fits perfectly in an 8 x 2 round baking pan. You can also use an 8 x 8 square pan which has an 8-cup capacity. Liberally grease the inner sides and bottom of the baking pan to be able to remove the sticky rice cake easily after steaming. You can also use wilted banana leaves to line the pan or parchment paper if you like. 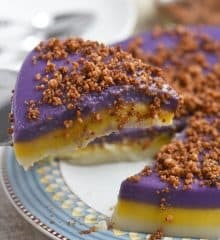 To make the sapin-sapin extra special and more traditional, stir in about 1/2 cup of mashed cooked ube to the purple-colored mixture and finely chopped jackfruit (langka) to the yellow-colored mixture. I use about 3 to 4 drops of each extract to achieve the color I like. Note that the colors of the tinted batters will be light but will deepen when steamed and cooked. Do not cover the kalamay until sufficiently cooled as the steam will cause water puddles on the cake. Give this sticky rice cake a try. You’ll be amazed at how something so gorgeous and delicious can be put together in less than an hour. It will be the perfect centerpiece for your next party! In a pan over medium heat, add coconut cream and bring to a boil. Cook, stirring occasionally, until liquid starts to thicken. Lower heat and continue to cook. As oil starts to separate and solids begin to form, regularly stir and scrape sides and bottom of the pan to prevent from burning. Continue to cook and stir until curds turn golden brown. Drain latik from the oil and store in separate containers until ready to use. Generously brush inner sides and bottom of an 8-inch round baking pan with the oil. In a large bowl, combine glutinous rice flour, coconut milk, condensed milk, and sugar. Stir together until sugar is dissolved and mixture is smooth and well blended. Strain the batter using a fine-mesh sieve and divide evenly into three bowls. 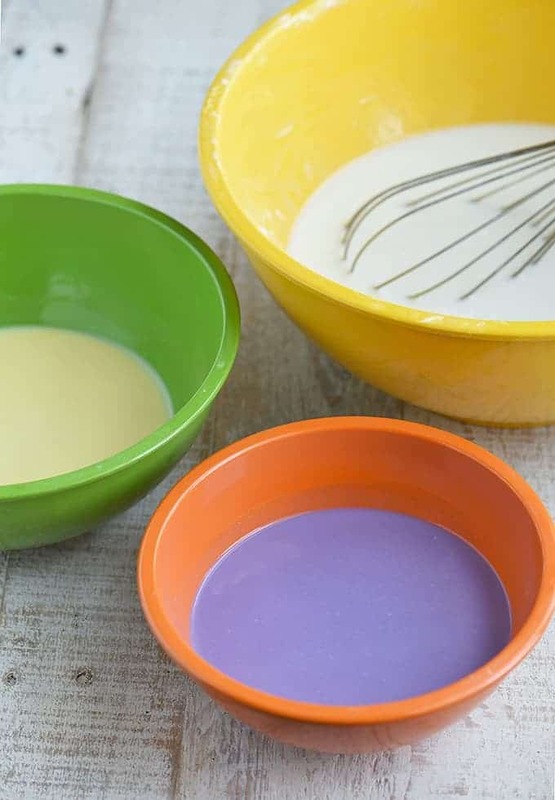 In one bowl, add ube extract and stir until color is well dispersed. In another bowl, add Langka extract and stir until color is well dispersed. The remaining portion will be white and plain. Pour ube-flavored batter into the prepared baking pan. Steam for about 10 minutes or until set and toothpick inserted comes out clean. Carefully pour langka-flavored batter over purple layer. Steam for about 10 minutes or until set and toothpick inserted comes out clean. Gently pour plain batter over yellow layer. Steam for about 10 minutes or until set and toothpick inserted comes out clean. Remove cake pan from steamer and allow to cool completely. Run a knife around the sides of the pan to loosen the rice cake. Place a wide, flat serving platter over cake pan and gently invert. Tap the pan a few times to release the sapin-sapin onto the platter (purple layer will now be the top layer). Liberally brush top and sides of sapin sapin with coconut oil. Sprinkle latik on top and cut the cake into serving portions. Mam, what could be used as substitute for rice flour? Here in our province we only have malagkit rice.is it okay if i have it ground with some water, then add sugar & coconut milk? Will I achieve a perfect sapin sapin, what is the measurement? When you say super gummy does it mean chewy or medyo matigas? I am sorry to hear the recipe didn’t work well for you. The kakanin should be sticky but still soft. Unfortunately, I don’t have one yet without the condensed milk. You can omit it if you like and just a bit more coconut milk and sugar to the batter. Hi, is it OK to use gluten-free rice flour? Thanks! hanggang ilang araw po ang itatagal nito pag hndi naka ref? Unfortunately, it won’t last long outside of the refrigerator because of the coconut milk, especially in hot weather. I forgot mine on the counter before and it already tasted sour after a few hours. In the picture, did you use a pie pan? it looks nice and it will perfectly fit in my steamer. 8×8 cake pan can’t fit in my steamer. 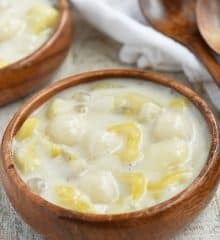 Is it ok to use canned coconut milk and cream instead of the fresh ones? This looks sensational…and easy….I love exotic Asian rice desserts which look complicated and wow the guests; and yet are straightforward. And while not exactly simple are certainly not hard to make. I love the sticky Black Rice puddings of Indonesia, and have been to a number of feasts where ‘secret’ Filipine recipes have been liberally given. Often and always expressing the love of the cook AND ( perhaps more importantly) the transmission of loving family recipes passed down through generations. I am not Filipino, but have some joyous contacts with the community. I love the sense that food expresses community and love. I am actually Australian born in England….but am possibly a reincarnated Asian food lover. I have three lovely daughters who are all great cooks…especially of exotic desserts. Thank you, Stephan. I hope you enjoyed this recipe! Like to make ahead of time and serve on xmas day..Can you freeze sapin sapin? I’ve never tried it myself but I’ve seen sapin sapin sold in stores here and they’re kept in the freezer. I am not sure, though, if there will be a change in texture. It might be okay as this is like mochi (made of rice flour) and mochi seems to freeze well. Madam, can I use the oven in cooking sapin sapin instead of steamer? 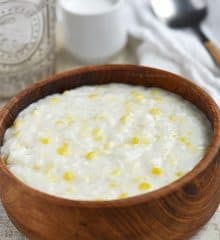 Is there a way to make langka flavor extract at home? or can it be replaced with jackfruit juice? You can use the langka juice as part of the liquid for the yellow part and maybe use food color to get the desired shade. Hi, what if I have a 5 layer steamer, can I steam them all on one time? You can’t steam all the different layers at one time because they go on top of each other. You cook them in one pan so you can’t steam them at the same time. If you cook all the separately and try to assemble them after, they won’t stick together like a sapin sapin should. Ilang cups po ang rice flour? It’s not listed po kasi sa ingredients pero nasa instruction. And how do you measure the flours? By “spoon and level” or packed? Thank u.
It’s supposed to read “glutinous rice flour”, I corrected the recipe to reflect this. No, I didn’t spoon and level ( Unfortunately I am not a very disciplined or precise cook). I just scooped from the bag and leveled it off. Yes, you can. Just make sure to grease the pan with coconut oil or butter para wag dumikit yung sapin sapin. Hi there! I love your blog! And the way you make your recipe since it is so similar to how my parents does it…Capampangan blood can be seen in similarities in taste and ways of cooking. I think I’ve mention that before in my first comment to you about a month ago when I first found your blog. Anyway, your sapin sapin looks amazing. My sister in law makes a mean sapin-sapin like this. She always would recite to me how she does it, but we never had the chance to get together, and I learn from her hands on. She always said it’s easy, but like you before I am intimidated by it. Thus I am so happy you took the courage to make and post this. Question though: what are the exact ingredients of the Ube and Langka flavor extract from the bottle? You see my children have severe allergies from gluten, casein, artificial coloring, preservatives, etc…yeah so pretty much I make everything from scratch. I have a feeling th Ube extract is aritificial? And I looked at the Langka linked to Amazon and it says Halal but it doesn’t mean much as Halal is mostly helpful if a product is made of meat. I really want to make this as my teenager son and pre teenager daughter has really gravitated with Filipino food and they’re voracious with anything Filipino food as long as it is GFCF and Feingold diet standard. Can you please help me with this? Thank you so much. Thank you so much for your kind words. I am glad you find Kawaling Pinoy useful in your homecooking. Yes, sapin sapin is a lot easier than I thought. I hope you can try it sometime. Unfortunately, this is does not meet GFCF standard as although it’s wheat free (I used rice flour), it has dairy. You can, however, eliminate the condensed milk and just add more coconut milk and sugar. I don’t think it’s Feingold safe as well as I used flavor extracts with food coloring and propylene glycol. 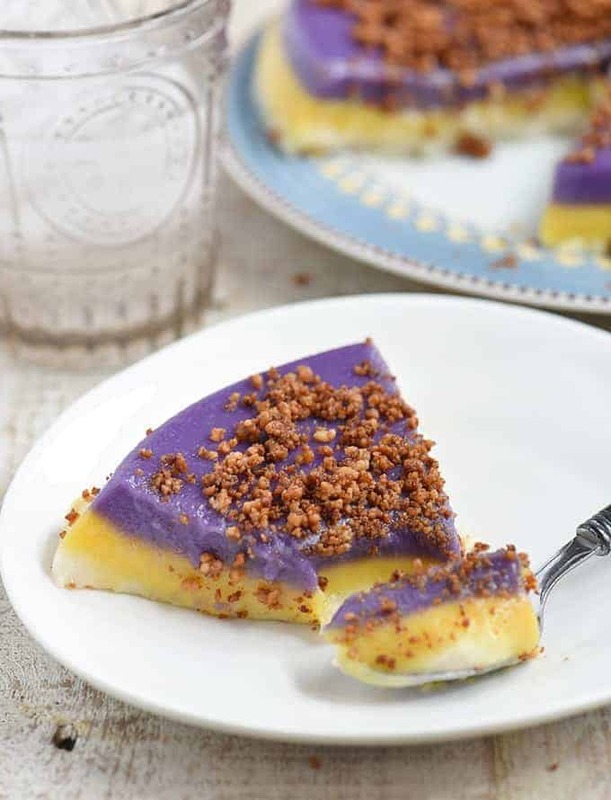 You can maybe, go with having the sapin sapin plain? I know it won’t be as pretty and not as much fun to eat but you still get the enjoyment of a delicious rice cake.